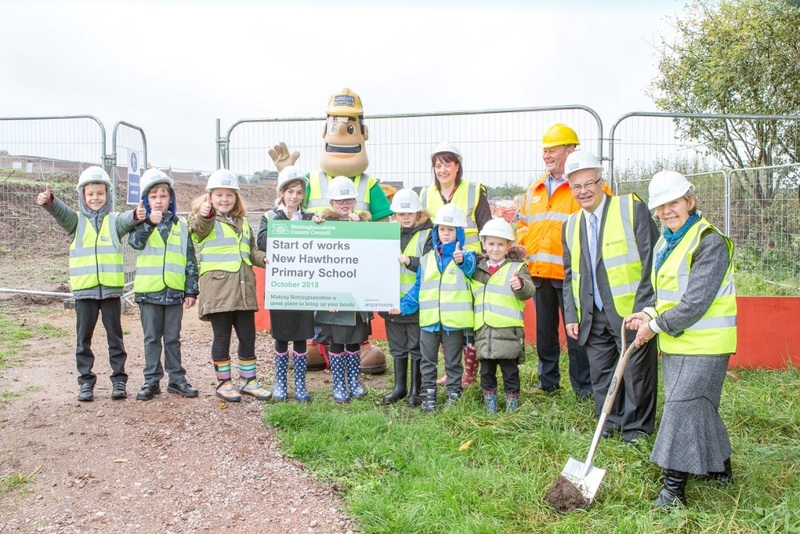 Construction works are officially underway at a replacement primary school within the new Westhouse Farm housing development in Bestwood, following a £5m investment from Nottinghamshire County Council. Pictured above pupils at Bestwood Hawthorne Primary, who were joined at the turf cutting ceremony at the site of their new school by Head Teacher, Rachel Jarvis; Cllr Chris Barnfather; Chair of the Children & Young People’s Committee, Cllr Phillip Owen and Leader of Nottinghamshire County Council, Cllr Kay Cutts. “There has been a considerable amount of new housing development in Bestwood over the last 10 years, which has attracted many young families to the area. With further housing development in Bestwood outlined in Gedling’s Local Plan, it was important that we acted swiftly to ensure the extra demand for school places could be met. Councillor Chris Barnfather, Chairman of Planning and Licensing Committee at Nottinghamshire County Council, has campaigned for a new school in Bestwood for many years in his capacity as local councillor for the area. Cllr Barnfather commented: “Generations of Bestwood children have been taught at the current Hawthorne school and it has served the community well for many years but is no longer fit for purpose and is unable to cope with the growing demand for places as the village expands.